According to Houzz, the leading platform for home renovation and designs, quartz worktops are on the rise in UK homes. The recently published Houzz UK 2018 Kitchen Trends Study, which surveyed almost 5,000 UK homeowners*, who are in the midst of, are planning, or recently completed a kitchen project, revealed that worktops are the most common major feature to upgrade during kitchen renovations. Among those upgrading their worktops, engineered quartz has increased in popularity as the leading surface material. A staggering 28% of homeowners opt for the durable material, ahead of granite (18%) and laminate (18%). It is most often chosen by homeowners between the ages of 35 and 54, as compared with those under 35 and over 55. 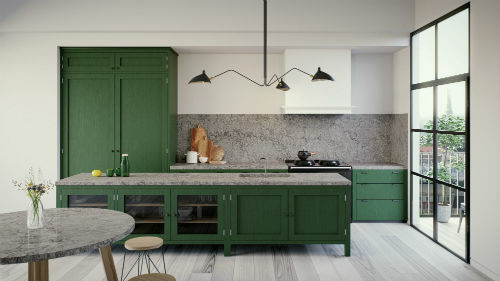 Caesarstone is renowned in the industry for having the best colours and pre-eminence in high performing on trend surface; from the beautifully veined marble finishes to the modern concrete series which perfectly emulates the patinas and textures of industrially-poured concrete. The process. 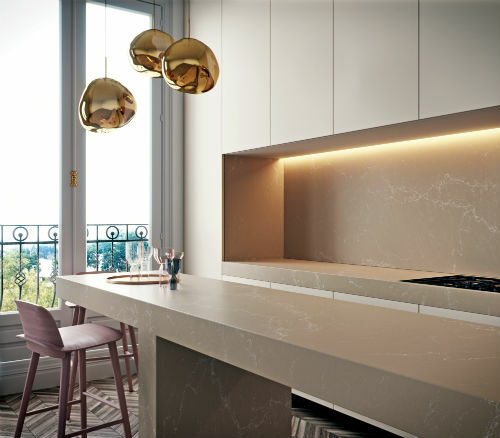 Quartz surfaces are made up of a blend of natural quartz product, pigments and polymers that are moulded, pressed and then cured to make a solid surface slab that can then be fabricated for a variety of uses. Premium quartz products are made to a very strict process to ensure high technical performance, aesthetic quality and uniformity. At Caesarstone, the process begins with a rigorous inspection of all incoming raw materials. These are then manufactured through a highly automated, yet strictly monitored process that includes a significant amount of time and resource dedicated to polishing and testing. Quartz is one of nature’s hardest materials. On the Mohs scale of mineral hardness, which is based on the ability of one natural sample of mineral to scratch another mineral visibly, quartz scores 7 compared to marble which scores 3-4. Diamond is 10 and chalk is 1. That means quartz surfaces are amongst the most durable surfaces available, a vital quality when it comes to areas as well utilised as the kitchen. A worktop that is scratch and stain resistant will keep your kitchen or bathroom looking beautiful for many years to come. Caesarstone tested its quartz products against marble and granite for impact strength, flexibility strength, compression and water absorption and they outperformed both marble and granite in all areas tested, confirming the supremacy of quartz when it comes to durability and being virtually non-porous. While granite and marble work tops generally need to be sealed and are more prone to marks and scratching, quartz does not need to be sealed by artificial means. 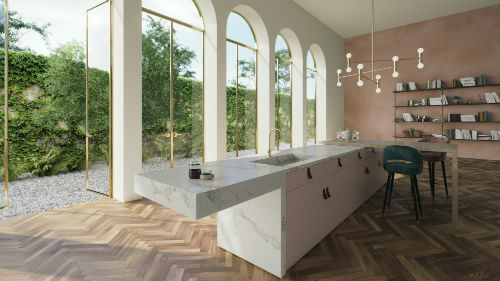 High quality, premium-engineered quartz surfaces offer product consistency, a wide range of colours and designs (Caesarstone UK offers a choice of 44) and finishes simply not possible with natural stone. High quality quartz can be cut to fit nearly any space, is extremely adaptable and available in differing thicknesses. This makes quartz ideal for a range of surface applications from kitchen and bathroom worktops, to floors, splashback and wall coverings. Unlike granite and marble, Caesarstone quartz, can even be curved using a thermal process, opening up a vast range of design options. The higher the quality of the quartz, the easier it is for the fabricator to work with and the better the look and feel of the finished result. Not only does quartz last longer than almost all other surface options, it is easier to maintain, clean and keep looking good for longer. Quartz doesn’t need sealing, treating, polishing or any other form of maintenance, except a simple wipe clean with household detergent and warm water. *Results from an online quantitative survey of registered Houzz users in the UK regarding kitchen renovation projects, fielded between 18th September and 29th September, 2017. The final sample consists of 4,976 respondents with a kitchen project. Additionally, when reporting findings by homeowners’ age, the sample combines data from this and last year’s survey (see last year’s report for more information), with 1,055, 4,650, and 2,110 respondents falling in the 25-34, 34-54, and 55+ age groups, respectively. The final data was reviewed to ensure representativeness of the Houzz user populations.